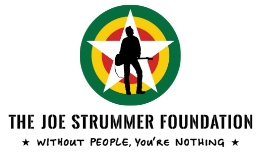 And he's doing it in aid of The Joe Strummer Foundation & Macmillan Cancer Care! I am a 55 year old teenager living in Condorrat just outside Glasgow. Just over a year ago, after many years of smoking, drinking, not eating properly, generally not looking after myself and after a bit of a health scare I decided to change my life for the better by taking up running. Now as someone who could get out of breath running a bath it was a big challenge! But with the love, help and encouragement of my partner Joan I started training and managed to run a couple of 10k races on behalf of a cancer charity. It was tough for a fat old git like me but I did it and I enjoyed the experience. This year I'm stepping things up a bit and will be doing some more 10k's through the year and will be running in the Great Scottish Run Half Marathon in Glasgow in October. There is another 'big' event in August when Joan and I are getting married and rather than receiving presents from our guests we will be asking them to make a donation to our nominated charities instead. Mine is of course TJSF and Joan's is Macmillan Cancer Care. Anything received will be split 50/50 between the charities. I have decided to run on behalf of TJSF because Joe was a hero of mine in my teenage years after hearing White Riot for the first time and then seeing The Clash play live at the old Glasgow Apollo (I actually appear for a brief second in the 'Rude Boy' film outside the Apollo, blink and you'll miss it!) They were happy happy daze! Joes "Without people you're nothing" spiel has almost become my mantra in life and his manner, outlook and philosophy will forever be an inspiration to me. If I can help TJSF help other people by my small efforts then I'll be a happy man. We are so proud of Stevie for doing this, and very thankful for his and Joan's very kind and generous offer of collecting donations instead of wedding gifts. Please, please if you can, help him achieve his target by donating to his fund. We will be following his progress closely during the build up to the big race & the big day! Go, Stevie! And these words ring so true: "without people, you're nothing"